Limited Time Deal: Get The Build-A-Business Bundle -- SIX Of Our Top Full-Length Business Building Courses For Big Savings! At NAMS, we're famous for our high-quality full-length courses. As a thank you, I'd like to help you build your business to the maximum. Your success is our success. So I'm offering you not one, not two, (keep going until you hit five)... but SIX of our our best courses, in one high value bundle. You'll learn how we build opt-in funnels that not only build our email list, but also adds the first product offer so that our list building efforts -- including paid advertising -- are totally self-funding. Working with Private Label and Done-For-You packages. Discover where to find the appropriate high-quality content for your niches. 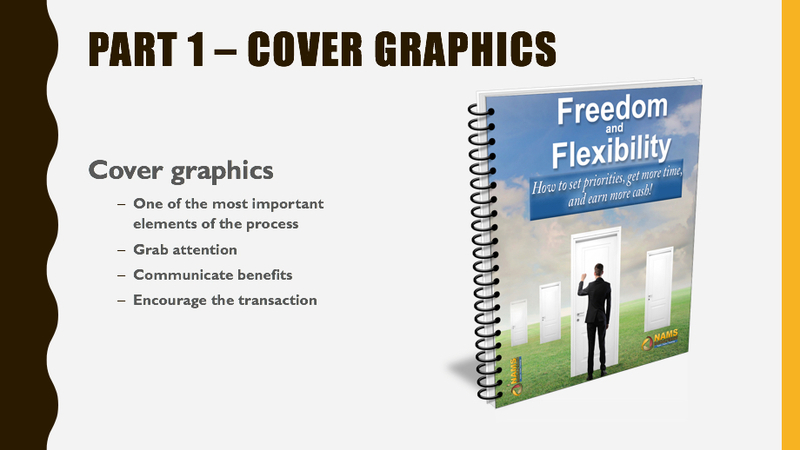 The key to the perfect giveaway is the first impression that comes with a high-quality and unique cover graphic. Discover how to create yours simply. 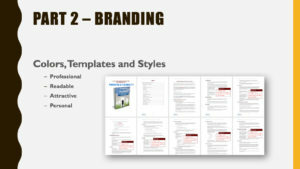 Transform your PLR content into your unique product with your consistent brand to establish a professional and personal optin gift and sell-able product of your own. 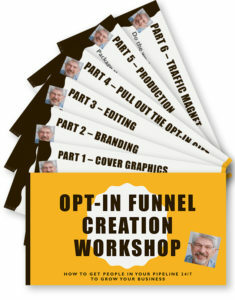 Pull the opt-in gift from the PLR product. 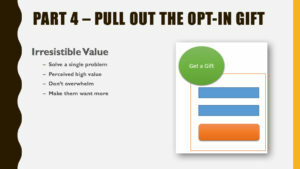 Make sure the opt-in gift solves a single problem with high-perceived value. It should also lead to the rest of the solution from the remaining content. Next, get the infrastructure set up to delivery your opt-in giveaway and the new information product in an automated way - take the fear out of the technology with these instructions. 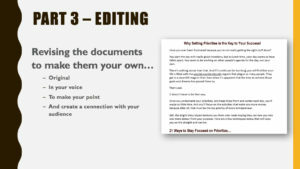 Using the slides in the PLR product, create a short video presentation to use as an automatic traffic generation tool to get those opt-in subscriptions on auto-pilot. How Well Does This Process Work? Using this exact process and PLR product developed live in the course, we generated $1200 in just 3 days from this single opt-in funnel. 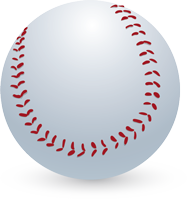 And we got nearly 1000 new prospects in our system. 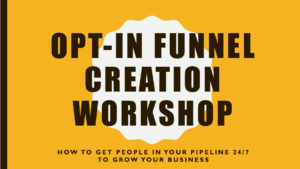 Reusable Opt-In Funnel process template to map out your funnels and a walk through of how to use it. A 4-part video series about different ways of boosting conversions using squeeze pages. Case Study Webinar where we reveal how we made $1200 and got nearly 1000 subscribers in just 3 days. Finally Start Making Sales & Even Double Or Triple Your Profits Just By Improving Your Sales Letter! 3000 visitors a month with a $97 product converting at 2% for a total of $5820 in sales? Tweaking your sales copy with this paint-by-numbers blueprint can do this! Double or Triple conversions with your existing sales letter or write a brand new killer one that takes your visitor from suspicious reader, and turns them into a trusting, eager to buy customer at the blink of an eye! Personalizing your copy to speak directly to your “Target audience” and make them feel like you have written the sales copy specifically for them. Step-by-step blueprint for assembling your sales page in the most effective way to create the fastest converting results possible. Discover the difference between creative writing and writing for persuasion by learning the skills to simply get others to agree with our opinions and come over to our side. Basically get what you want and when you want it by helping your audience come to your point of view. Certainly, the BEST-KEPT weapon of every top copywriter or online marketer has got to be their swipe file. Swipe files are a collection of the best ads, headlines, sub-headlines, bullet points, closings, call to actions, guarantees, emails, etc. We show you how to create your own and give you one to start with. 5.5 Hours of easy-to-follow video training that you consume as you need it. 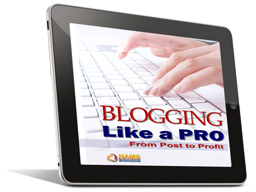 Finally, You Can Have Blogs That Are Productive AND Profitable! In Blogging Like a Pro, I’ll walk you through a step-by-step process for defining what your ideal reader wants from you... drawing them to your blog... and getting them to engage the way you want and need. Get your readers to tell you what they want you to write about. Consistently write new material and focus on quality, not quantity. Understand current blogging tactics with the right article length, images and metrics. Discover how to easily make money from your blog by giving readers what they want. We’ll start off by discussing modern trends in blogging and what the most successful bloggers are doing. Take a close look at what’s not working in today’s blogosphere and what your metrics tell you should be doing on with your blog. The reader persona, or avatar, is often a very confusing concept for bloggers (and copywriters, business people and authors). Discover the key to unlocking this secret. By the end of this module, you’ll know exactly who you’re writing for and how to pinpoint the things they want to read in your blog. Module 2 made reader personas clear. Now we’ll get into the nitty-gritty of content creation…. How to Quality articles your readers want instead of focusing on Quantity. And we'll focus on formatting that content so it stands out from the garbage amateurs litter all over the web. With your ideal reader and the ideal content, you now move into social media for a fun way to interact with your readers and get maximum exposure for your content using automation and syndication with the most effective tools and techniques pro marketers use. With a clearly defined niche, a clear picture of your reader, a content plan in place, and social marketing mastery, what's next? 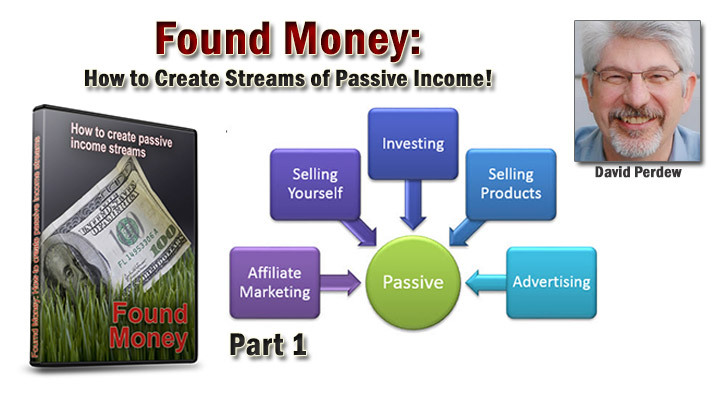 In this module, you’ll discover most effective monetization strategies. We’ll help you discover the gold in your content and turn it into cash. Everything you have learned so far is a foundation that needs consistent application. And this is where most people fail. Taht's why we help you focus on building habits to create strong writing skills and processes that work for you. Blogging is not a one-size-fits-all pastime and without creating a consistent process that leverages your specific strengths and weaknesses, your hard work will continue to be undiscovered greatness. Now You Can Follow A Proven Info Product System For Generating Real Sales Online From Anywhere You Have An Internet Connection! While so many others are plugging away trying to figure out this whole "online business thing" without much success, you could be quietly building a sustainable online business using the methods taught in this video course. In this 15 module video course, I reveal exactly how you can setup and start to sell your own high quality information products from scratch with no prior experience needed. And this course is not just for beginners, everyone will find value in it! 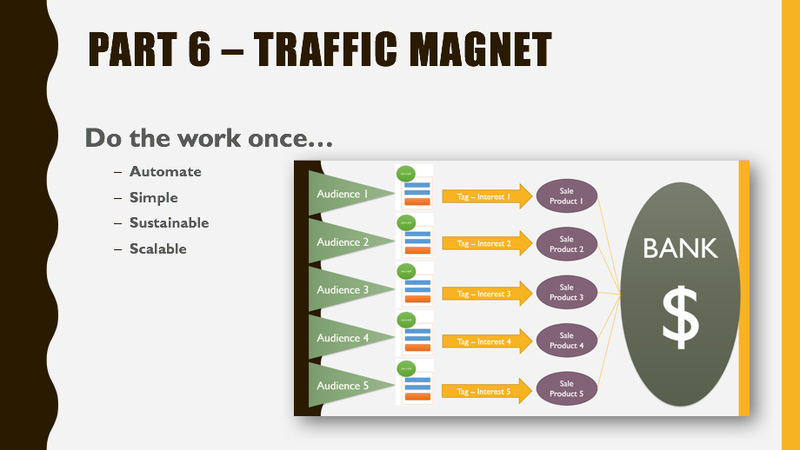 Discover a highly effective strategy to target the perfect audience every time! All of this training is great but if you don't know"How" To actually do the technical set up of getting your site, sales pages and delivery pages done then how can you actually launch your product? Problem Solved. Each Lesson in this course has a technical training video to go along if you need tech help too! 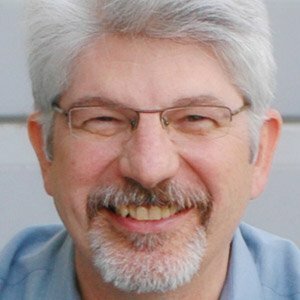 I am David Perdew, CEO and Founder of MyNAMS.com, and I have built a list of thousands. Now I'm challenging you to join me in our continuing efforts to grow our lists exponentially. I will take you by the hand and show you how we do it, peeling back the curtain to reveal every action we take. You'll apply these same concepts to your business in real time. Clearly, it's a great challenge - its going to be hard work and big fun but worth it, for sure! The reward is a lifetime of freedom because you've built your best asset - your list of prospects and customers who fund your lifestyle because you exchange great value and respect. That's what we teach. Dennis Becker - Can You Build A Six Figure Business From a Free E-Book? 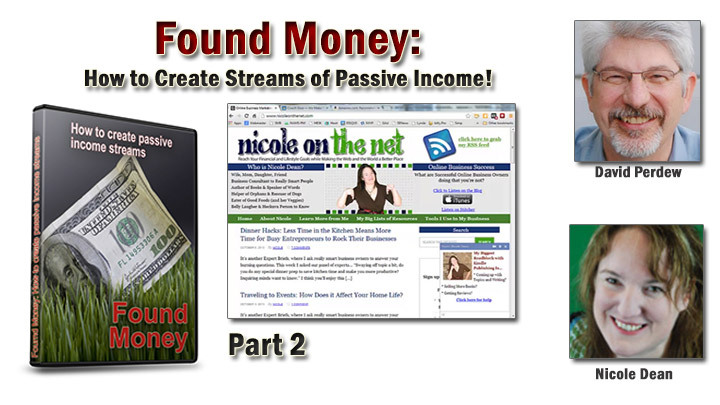 Nicole Dean - Monetize Your List - Even the Freebie Seekers! 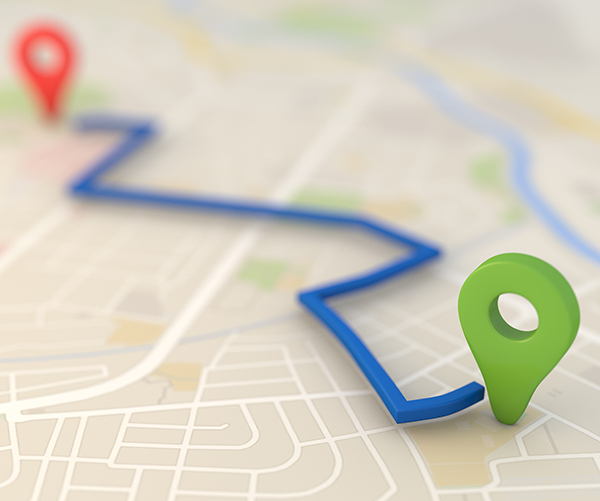 We'll follow our 2-part delivery system where we focus on "Discover" and "Implementation." 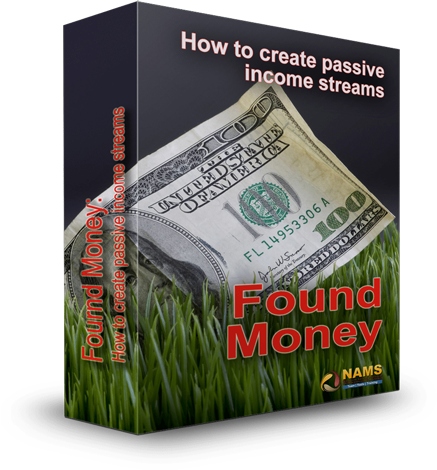 Discovery is the first hour, and we'll look at the 5 main paths to building fast streams of passive income. Don't worry! Both make money. 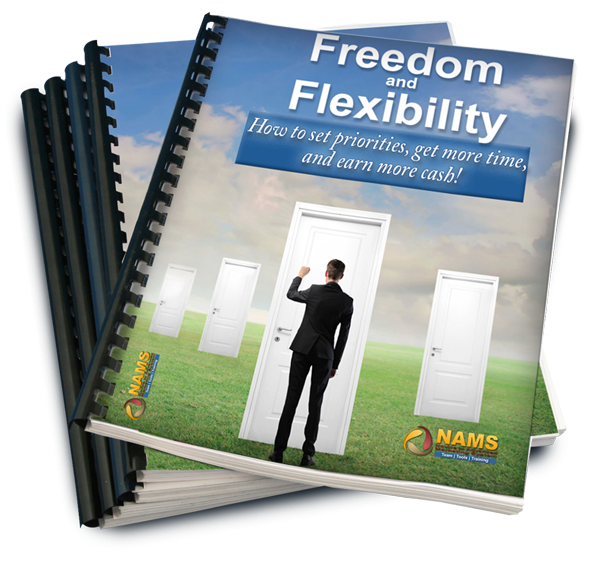 We just help you determine which path is easiest for you and how you can be most successful. That's included in our Step-by-Step Passive Income Blueprint Webinar. Without consistent and thorough implementation, you're just spinning your wheels. 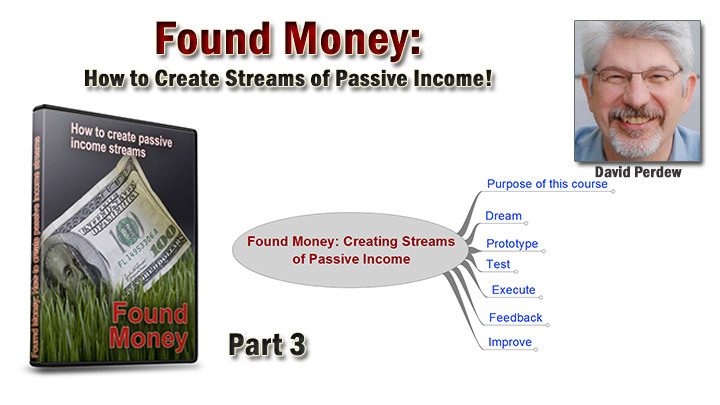 So, in a very special private workshop, we conducted a live webinar where we help you build your passive income plan and begin implementing these steps on your website. If you don't have a website, don't worry! We demonstrate how to start driving income into your PayPal account even if you don't have a blog or website. This was a very special 2-hour implementation session. We stand behind the Build-A-Business Course Bundle and offer a cast iron money back guarantee. If you are not 100% satisfied with the product you’re getting today we’ll refund your money. So now you know you can try us risk free. These Courses Are Normally $197 Each. Get them now in this specially priced value bundle! No Thanks... I'll pass up this incredible business building offer and will pay more later.